This error 400 – Bad Request simply means either there is an error in the way you tried to type the website into your browser or your browser and web server where the site is hosted are having problems communicating with each other. Most often 400 – Bad Request is due to a bad Internet connection. Does this happen for other sites? If the problem occurs on multiple sites you are trying to access this indicates that the problem is on your local computer and not with the websites. Is your local computer secure? Do you keep all the security updates for the operating system up-to-date as well as keeping a good antivirus and malware scanner current on your computer. Any type of malicious software or security breeches on your computer can cause a wide variety of problems including the 400 – Bad Request error. Have you installed any web based software or games? Online or web based games have great risk involved with them and have been known to cause numerous browser related issues. Try to uninstall the software, and in a worst case scenario you will have to format your computer ans start with a fresh install of the operating system. Have you cleared your browser history recently? Clear your cache and cookies. Sometimes a 400 – Bad Request error can be caused by having corrupt cookies or a cached site that is incompatible with the browser. Take the necessary steps to clear the history, cache, and cookies for your browser and try reloading the website. Does this error come up for the same domain name across multiple browsers? 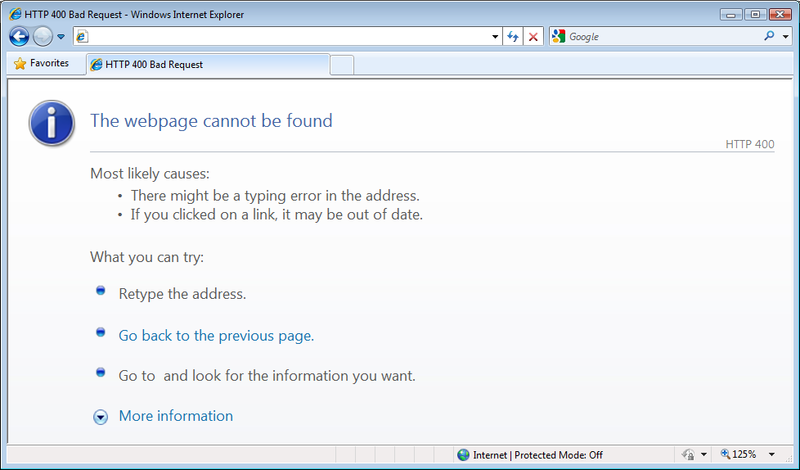 Try using Firefox, Google-Chrome, Safari, and/or Internet Explorer and see if all of them get the same error. If they all get the same error this may be due to your Internet connectivity and you will need to run a traceroute (shown in next step) to further troubleshoot the location of the problem. Can you ping or run a traceroute to the server IP address? Open a command line or terminal and try running the following commands. The traceroute will show ever server you have to go through to get to the website and can show where the problem may be occurring. This traceroute shows the servers the connection had to go through from fls.byu.edu to the web hosting platform. If your traceroute does not make it to the server you might be able to manually change the DNS settings for your computer, reconnect to the Internet, and access the site. Google’s DNS IP’s are 8.8.8.8 and 8.8.4.4. Have you changed any hardware settings recently? Sometimes changing settings improperly will cause your computer to not be able to connect to the Internet. If you have changed any settings try changing them back and refresh the website you are trying to load.